Cost – Traveling with a group saves you money! As a group, we get the best prices for hotels, restaurants, and attractions. We pass on these savings to you! Booking a vacation by yourself would cost you sometimes thousands more than booking a group tour with Moostash Joe. That is a chunk of change $$$$. Come with us and get the most out of your money. Safety – Safety is a very important part of traveling. When you are with a group, you will travel with many other tour guests and have a trained guide and driver to assist you in an emergency. You will not be alone. If an emergency happened, our guides and drivers will do everything possible to help your situation. Don’t risk being by yourself in an emergency while traveling. Come with one of our groups and feel safe and secure. 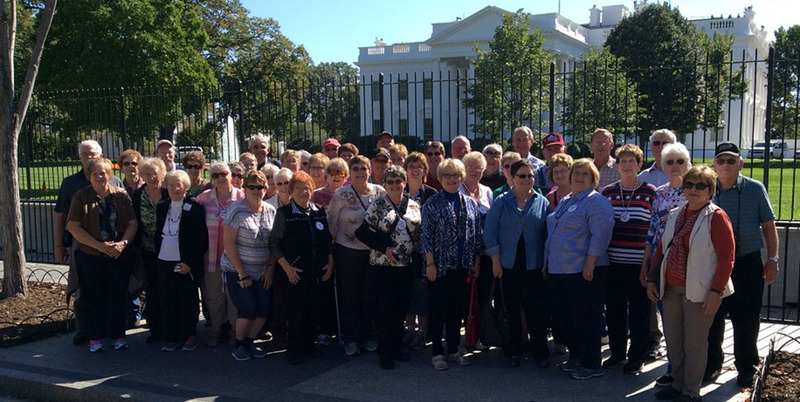 Sightseeing – There’s no better way to visit some of the most historic sites than by traveling with a group. We have over 40 years of experience handling itineraries and understanding destinations. You will be sure to see all the major sights, as well as a few hidden gems along the way. At most destinations, we hire an experienced, local, and knowledgeable step-on-guide to give you important history, facts, and memorable stories about each city, location, or national park. We guarantee your family, grandchildren, and friends will be so impressed with what you learned when you get back from your adventure! Tour Details – Planning a big trip can be stressful, especially when you’re going to a place you are unfamiliar with. Moostash Joe Tours handles all your transportation, hotel accommodations, sightseeing, and most meals. All you have to do is sit back, relax, and enjoy the tour! With our professional tour directors and drivers by your side the whole trip, all of your tour details are thought-out and planned ahead of time. Having a Tour Director also helps alleviate any issues that pop up with traveling, so that your only responsibility is to sit back and enjoy each stop on your itinerary. Friendships – Probably the best part about traveling with one of our groups is the lifelong friendships you create along the way. Traveling with a group creates an immediate bond, simply due to the experiences and memories you’ll share together. More often than not, you’ll return home with a new network of friends you can keep in touch with and travel with again. It is time for you to go and experience God’s creation and meet lifelong friends along the way! You can’t get this when going by yourself!